A vehicle with a very interesting history, 96202 started life at Dunkinfield in 1928 as a non corridor composite coach (CL). It ran in this form until 1959 when, for reasons now lost in the midsts of time, it was selected for a complete rebuild as a bogie Covered Carriage Truck. This was a strange decision as numerous Mk1 vehicles were coming off the production line at the time. 96202E (the E suffix being an error as this was in fact a BR series number) emerged in maroon carrying large "Anglo Scottish Car Carrier" lettering. The rebuild proved of little benefit as it was withdrawn less than 6 years later. However 96202 entered departmental service as a stores van, lasting until 1991 when it was preserved by a RVP member and moved to the GCR. Reskinned and fully restored to 1960 condition and entered service in 1995. It ran with the TPO set and in several photo charter trains, until being stopped for a repaint in 2001. 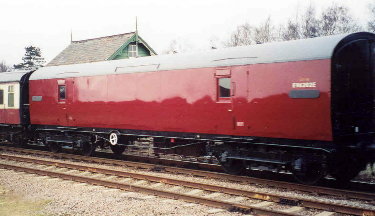 It remains serviceable, having been repainted in plain maroon livery in 2008.